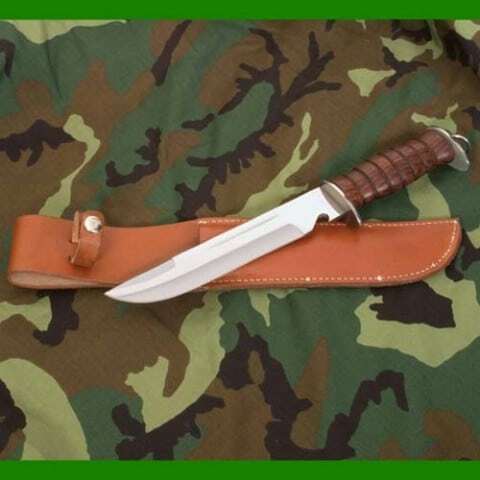 Favourite trench knife carried by the GI’s. 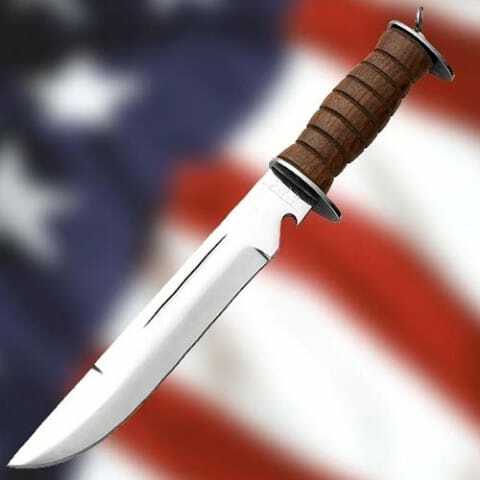 Based on an original described as an E.G.Williams Fighting Knife and made by E.G.Waterman of San Francisco. Razor sharp tempered hand forged high carbon steel 18cm blade with a bottle opener built into the blade shoulder. Shoulder of the blade stamped ‘E G W KNIFE’ just like the original. Front and rear guards help give a secure grip. Contoured and grooved close grained dark finish wooden handle. Pommel features a lanyard ring and the top grained leather sheath is riveted and sewn with a wax thread. Comes with a top grained leather sheath riveted and sewn with waxed linen thread. Feels good in the hand.